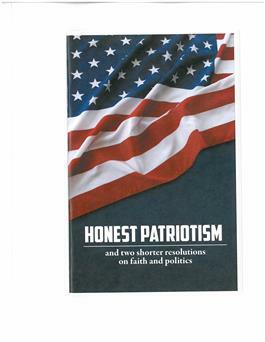 Honest Patriotism addresses threats to the vital freedoms of the First and Fourteenth amendments to the U. S. Constitution due to changes in communications, media, and politics. It calls for measures of public accountability for truthfulness in the public square in all its forms: over public airwaves, through cyberspace, and through required public disclosure by government agencies, profit and nonprofit entities. Except for hate speech, freedom of speech is to be untrammeled, with widest possible access to information, protection of the press, publication of research, and public assembly rights. Respect for privacy of personal information from government or private surveillance and commercialization is affirmed. Starting with our theological appreciation of truth, the church itself should model full participation and transparency in governance. “Honest Patriotism” is meant to include disenfranchised groups (following Donald W. Shriver’s work in Christian ethics). The short declarations “Against Autocracy” and “Against Racist Nationalism” are one presbytery’s way of addressing the issues involved, including demonization of others and corruption of public morality.